The year after the eruption, the hop harvest in Britain, in particular, was hammered. Newspapers from September 1816 onwards engraved a picture of misery. 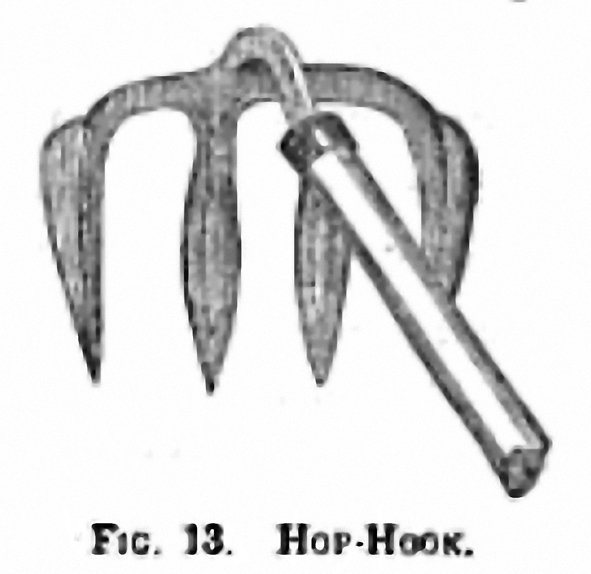 The Hereford Journal reported that locally “the hops have nearly all been destroyed by the inclement season.” At Worcester fair, the Morning Post said, “there was not a pocket of new hops”. At Stourbridge Fair, just outside Cambridge, normally one of the country’s biggest hop marts, “the supply of hops was very small, not more than half a load.” In Farnham, Surrey, the hop cones were “uncommonly small”, and the harvest was set to be no more than a quarter of its usual size. At Weyhill fair in Hampshire in October just over 700 pockets of hops were on sale, down from 3,000 the previous year. The final harvest was just under 100,000 hundredweight of hops, against 265,000 hundredweight the previous year and an estimated annual consumption of around 210,000 hundredweight. By December the shortages were being reflected in the prices being charged at the hop market in Southwark: £10 to £15 a hundredweight (112 pounds) for Sussex hops, £10 10 shillings to £17 for Kents, and £18 to £25 for Farnhams, all two to three times more than the prices being charged the previous year. Normally foreign hops were kept out of Great Britain by a deliberately crippling rate of duty: in 1711, when a tax of one penny a pound (nine shillings and fourpence a hundredweight) was first laid on British hop producers, the “protective” duty on foreign hops imported into Great Britain was set at three times as much, £1 8s. (Foreign hops were banned from import into Ireland entirely, unless and until, at least in the early 19th century, British hops reach £9 a hundredweight.) Over the following century the duty on foreign hops rose to £5 18s 10 pence a hundredweight in 1787 and, by 1818, £8 11s. The tax on home-produced hops, meanwhile, had merely doubled, to 18s 8d a hundredweight. The result was, effectively, a bar on the import of foreign hops, except, as happened in 1800, when there was a severe shortage and the government was persuaded to drop the tax on imported hops temporarily down to the same level as that on the home-grown variety, or, as in 1817-18, when the prices being charged for home-grown hops in Britain were so high that the import tax on foreign hops scarcely mattered. Hanbury’s comment about American hops tasting as if they had been dried with pine wood is fascinating and revealing, since it looks to be the first ever reference to the “piney” aroma associated with some of today’s American hops, such as Chinook and Simcoe: an aroma that, along with others found in many popular hop varieties, is almost certainly derived from native American wild hops in the ancestry of American cultivated varieties. The oil that is associated with “piney” flavours in hops is myrcene, which also gives floral and citrussy flavours: wild American hops are particularly high in myrcene compared to European types. So, too, are most varieties of cultivated American hops. You will sometimes see it asserted that hops were “introduced” to North America in the early 17th century by Dutch and English settlers. In fact, when Europeans arrived, there were already three native North American hop varieties growing across the continent, where they had been for around a million years, after migrating from Asia: Humulus lupulus var. neomexicanus, which as its name suggests, grows in the Rocky Mountains area, from the Mexico border to Saskatchewan; H lupulus var pubescens, which is found in the mid-western United States; and H lupulus var. lupuloides, which grows on the eastern seaboard from New Brunswick to the Mason-Dixon Line, and right across to the Dakotas and Manitoba. 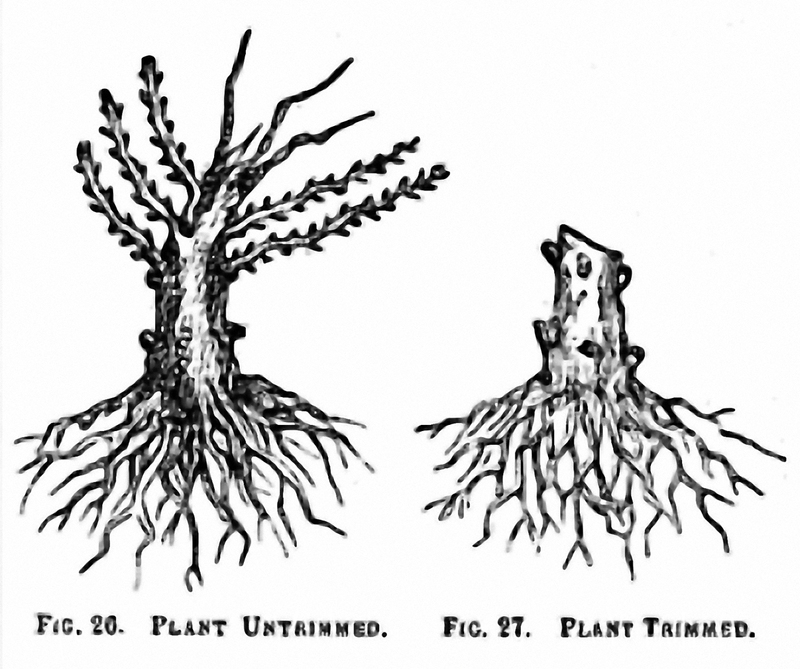 It looks as if, judging by Hanbury’s comment to Rush about the “pinewood” flavour of American hops, cultivated European hops had already interbred with native types in North America by the start of the 19th century (and probably much earlier): presumably the lupuloides variety that the first settlers in and around New England would have found growing in the woods and valleys near their farms. Genetic studies have shown that Cluster, one of the oldest varieties of American hops, is a mixture of native and European hops, presumably created accidentally. In the past hundred years, interbreeding between wild American and cultivated European hops has been conducted on a more scientific basis. Brewers Gold and Bramling Cross are just two varieties created deliberately by crossing a European variety with a wild hop from North America, in the first case a wild female from Manitoba and a male English hop, in the second a wild male hop from Manitoba and a female Bramling hop (a Goldings variety) from Kent. Both the lupuloides and neomexicanus varieties are found in Manitoba, and nobody seems certain which of those two were the “wild side” parents of Brewers Gold and Bramling Cross. Quite possibly, in fact, the wild parents were themselves crosses between the two North American varieties. Rather more randomly, Cascade, frequently described as the most popular hop with the US craft brewing industry, was born in Oregon in 1956 (but not release until 1972) in a breeding programme via open pollination of a female plant of more-or-less known European lineage by a male parent of unknown provenance which later studies strongly suggest was of wild American origins. One other interesting point arises from Hanbury’s comments to Rush: if the dreadful harvest of 1816 (and 1817 was not much better, at barely two fifths the size of 1814’s crop) “had brought American hops into demand, the quality of which was better for brewing than the English”, then were American hops used during the shortage of English ones to make pale ale for the Indian market? In other words, were American hops being used to make IPAs (which weren’t then known as IPAs, of course) two centuries ago? Well, with the enormous caveat that we don’t have any evidence for it whatsoever, yes, it’s distinctly possible that in 1817 and 1818 the brewers shipping pale ale to India from England used some American hops in that pale ale because they couldn’t get enough English ones. Indeed, it verges on the probable that some foreign hops, from North America or continental Europe, went into ales and beers shipped to India in those years, simply because poor harvests meant the supply of English hops was so much smaller than the demand. In 1817 and 1818, almost 52,000 hundredweight of foreign hops were imported into Great Britain to make up for the poor British harvests. The Hodgsons at the Bow brewery, a few miles east of Truman’s, who were still at this time the main suppliers of pale ale to India, would have had just the same problems that Truman’s and everybody else had in buying sufficient supplies of hops after the harvest collapsed in 1816, and may well have welcomed hops from the United States, with their higher bitterness, regardless of their aroma. So American hops in IPAs may have an ancient pedigree. However, British brewers generally continued to avoid American hops except in times of shortage. 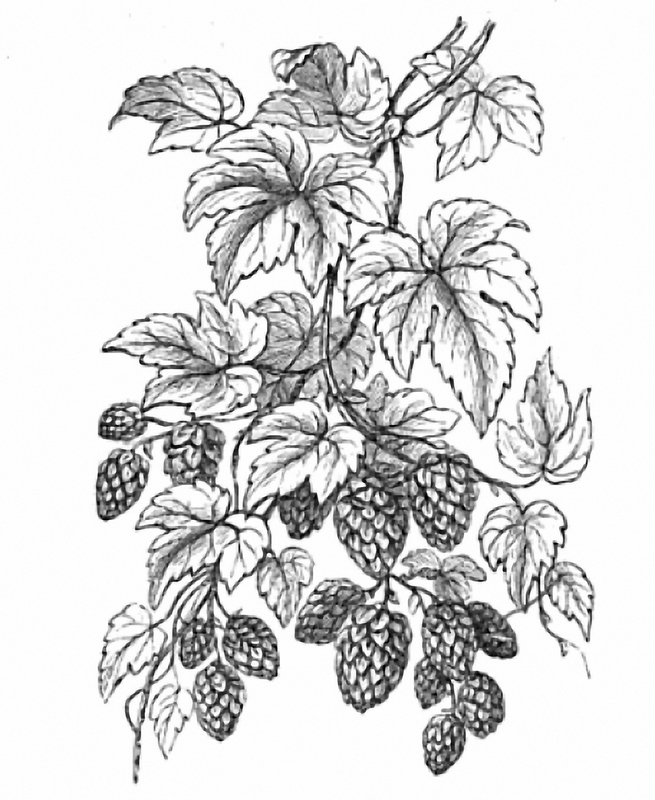 British comments about American hops frequently used the adjective “rank” to describe their aroma, which a writer in the Edinburgh Review in 1862 blamed on “the soil in which they grow”. Was this “rank” smell and taste that British brewers so deprecated the “catty” aroma many find today in American hops such as Cascade, Cluster, Simcoe and Eroica (descended from Brewer’s Gold via open pollination)? If it was, then, it’s (1) another example of the antiquity of certain kinds of flavour in cultivated American hops and (2) almost certainly another of the characteristics derived from American cultivated hops’ wild neomexicanus and/or lupuloides sides of the family. “Last year two bales of New York grown hops were sent to London as a sample; a committee of brewers was appointed to examine them, and they arrived at the conclusion that these hops were fifty per cent stronger in aroma than those of England. The committee waited on Sir Robert Peel with this conclusion, and in the new tariff a decrease of the duty to just one half or £2 5s per 112 lbs, is proposed. A reduction of the duty has been advocated in England for a long time, on the ground that a diminution in the cost of hops would induce the brewers to use nothing else in their malting; but the protective agricultural interests have as yet proved too strong for the manufacturers. It is believed that with the proposed reduction of duty in England, this article will become one of the principal articles of export from this State; indeed, farmers in this State have, in anticipation of it, already laid out grounds enough to increase the export thirty-three per cent within two years. The average product, per acre in England, according to the London Mark Lane Express, is for the last twenty years, less than 500 pounds per acre, while the average of the American harvest is 1400 pounds per acre. 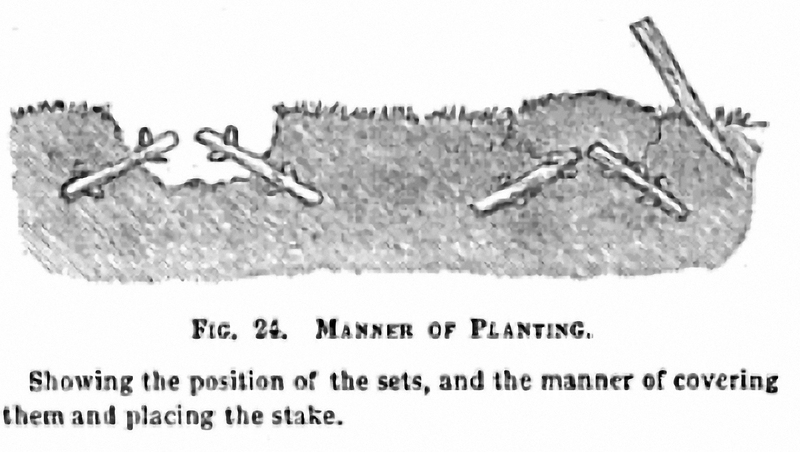 Once again the English hop growers declared that the cut “would ruin all the landowners, tenants, and labourers of Sussex and Kent, and throw thousands out of employ.” But while imports from both Europe and America certainly rose, evidence given at a parliamentary inquiry into the hop duty in 1857 suggested that every year the quantity of hops imported into Great Britain was more or less balanced by the quantity exported. The only year that American hops were imported in any quantity was after the failed harvest of 1854, when the import duty was again cut to the same level as the tax on domestic hops, and enough hops were brought in from the US (which sent 18,000 hundredweight) and Belgium to drive down the price of poorer quality Sussex hops by half. Of the “western” hops, “those grown in the western part of this state” (presumably New York state: it would be another 20 years before hops were grown in the western US, although in 1846 it was said that some hops “of inferior quality are raised in Ohio and Indiana”), Keeling and Hunt’s correspondent declared: “For certain characters of ale, and for brown beer and porter, there are no hops grown in the world to compare to them … Our western hop is much stronger than our eastern, and is used almost invariably by our porter and brown ale brewers, and for the manufacture of stock liquors.” (The statistics for 1845, incidentally, showed the New England states growing 4,250 bales of hops, and New York 4,000 bales). Despite the threat of foreign competition, however, starting in 1860 the English hop growers themselves allied their regular agitation for an end to the domestic tax on hops with a call for the abolition of the duty on foreign hops as well. This seems to have been prompted by a feeling that the free trade sentiments of the then government would not have scrapped the domestic duty without ending the duty on imports as well. At first the Chancellor of the Exchequer, William Gladstone, resisted the hop growers’ calls, probably because in the last half of the 1850s the hop tax had brought in record revenues, culminating in almost £400,000 being collected in 1859. Inevitably, however, 1860 saw yet another dreadful harvest. Gladstone had predicted in his budget for 1860, set in the spring, that the hop tax would bring in £300,000 that year. In the end the take was less than £70,000. The next year was again poor, with a domestic tax take from hops of just £149,000. Prices by December were up around £9 a hundredweight, and “large” quantities of Belgian, Bavarian and American hops were being imported to make up the shortfall: large enough quantities so that a big fire in Tooley Street, Southwark in the summer had seen 5,000 bales of American hops destroyed. Gladstone, one of the smartest operators in British political history, saw a way to make it look as if he was doing the English hop growers a favour, and at the same time end the wild swings in revenue represented by the hop duty. Even better, he could also secure the same or more tax income. For his 1862 budget, he announced that he would, indeed, be ending the hop duty, on both domestic and foreign hops: but he was putting up the cost of a brewer’s licence by three pence per barrel of beer produced. That three pence a barrel represented the former tax on the two pounds of hops that was, Gladstone told the House of Commons, the minimum that went into a barrel of beer. He also introduced, for the first time, a licence for home brewers, who would now have to pay 12s 6d a year if their rent was greater than £20 a year for private home owners (maybe £1,300 a month today), or £150 a year for farmers. At a stroke he had turned a wildly variable source of tax income into a steady one without offending too many people. By 1889, despite the previously poor reputation that American hops had had for flavour (even in 1875 one commentator called them “strong, coloury [but] badly flavoured”, a spokesman for Bass could tell the Pall Mall Gazette that while the best hops came from Kent, “there are none to equal them in the world”, “The Americans, however, are greatly improving in their cultivation of hops, and some very fine ones come from the north-eastern states.” The spokesman also revealed that Bass used no Bavarian hops at all. American hops were now divided in the UK market into “States” and “Pacifics”, with hops from Washington, Oregon and California all available at the hop market in the Borough. Hops from the US continued to arrive in Britain in considerable quantities: in 1908 yet another parliamentary inquiry into the hop industry (there was also one in 1890) was told that half the hops imported into the UK came from the United States, and 90 per cent of US hop exports went to Britain (with much of the rest going to Canada, Australia and India.) Until around 1905 most of the American exports of hops to the UK came from the Atlantic states, with increasing amounts then arriving from the Pacific states, notably California. The introduction of prohibition in the United States gave the American hop industry a massive incentive to increase its exports, of course, and in the three years 1920-1922 more hops, many of them American, were imported into the UK than were grown by English hop growers. The howls of pain from the English growers were eventually met by the imposition in 1925 of a £4 a hundredweight tax on imported hops, which, except in years of poor English harvests, pushed imports of hops down to minimal levels: by the early 1950s hops imports were down to less than 1 per cent of total UK hop usage. Previous PostSo who are the big beery twitterers?Next PostIndia Session Ales – tremendous new trend or oxymoronic category fail? Excellent stuff. You may have difficulty going further back than 1816 for a few reasons. The upstate economy did not recover from the Revolution for almost 20 years after the war’s end in 1783. Then Potash from forest clearing starts to be sold in Montreal. Plus, there was a devastating blight from the Hessian fly which caused a general shortage of food. Then, the War of 1812 comes along, a war neither side near the border wanted. There were few grudges apparently as Albany Ale is advertised in an 1816 newspaper here in my very British fortress town. Made from the previous year’s crop, the first of the stable ones since the 1770s when the Baronet of NY ran the whole area for the Crown. The first commercial hop farm in New York was operated by James Coolidge. Coolidge emigrated from Massachusetts to Madison County, and brought with him a rootstock from that area in 1808. 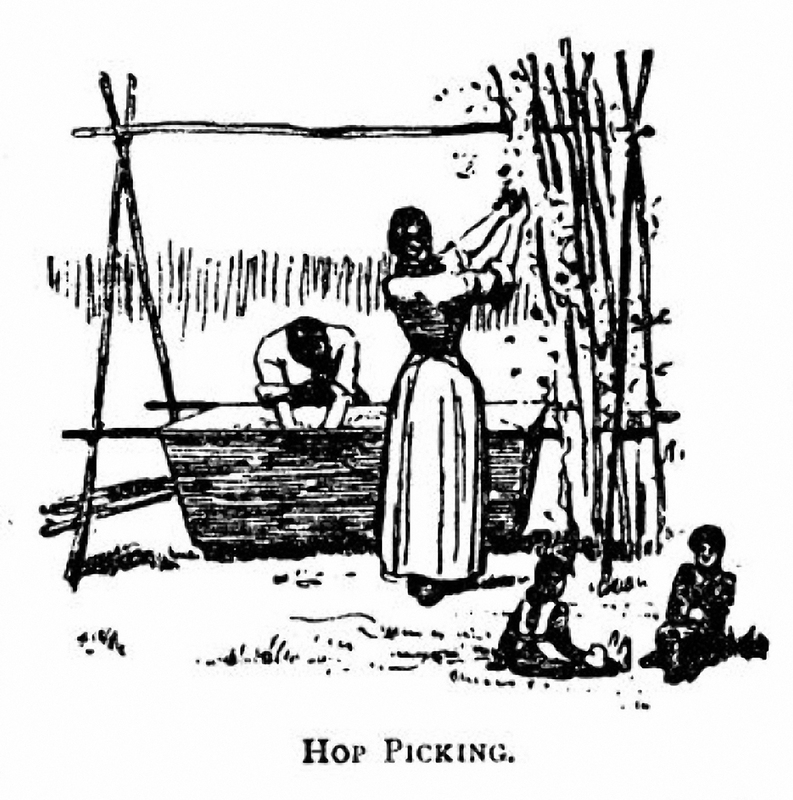 Within twenty years, eleven counties in Central New York were growing hops. 1817—just shy of ten years after Coolidge’s arrival—seems like just the right amount of time for the New York hops industry to have established itself with hearty and consistent harvests—harvests large enough to satisfy local demand, as well as being robust enough to export. That is an excellent date, 1808. It expresses the post Revolutionary reality neatly The hops in the Hudson appear to be used under the Dutch for home use in the 1600s but the rules of the Dutch West Indies Company required that commercial production of beer was to be with hops imported from Holland. Not sure how closely that rule was followed but it was part of the dream of the overall mercantile system of the colony system. Not yet clear what was going on from 1670 or so to 1770 except there was a hell of a lot of brewing under English rule with far less of the oversight of the Dutch empire’s system. Were there commercial hop farms in that period? The records have yet to be found on that in my research. Need to find me some texts on the system of eastern CNY agriculture under British rule. But there should be some agricultural economy around hops. There was a stable agricultural economy for most of that era with massive grain production. Things only get wonky after the French and Indian / Seven Years War ending in the late 1750s with, you know, those pesky British troops sticking around looking for something to get up to. Also, remember that the mid-CNY hop lands of the mid-1800s were largely forested Iroquois lands in the period up to 1750-1800 with some colonization under William Johnson, Baronet of NY to the north of the east west Mohawk river (tributary to the Hudson) and a bit in the Schoharie / Cherry Valley area that is depopulated in the Revolution. [Interesting to note there are communities called Schoharie / Cherry Valley to my west in Prince Edward Co, Ontario.] For a detailed explanation of the second opening of these areas of central NY in the 1780s and ’90s, get a copy of Alan Taylor’s book “Cooper’s Town”. Just as I was cutting the grass this afternoon did I ask myself “What was the hops growing situation prior to 1800 in New York?” We know Albany, by that point, was a well established brewing hub—let alone New York City—so, hops were obviously in demand. Where were the hops coming from? Were they being grown locally? From New England? Alan I think we have some work to do. When I mowed this evening all I thought about was how much I hate dandelions. Where are the 1700s pre-Revolutionary business records??? “From the middle of the eighteenth century until the early nineteenth century, Massachusetts was the acknowledged leader in hop production in North America. Middlesex County in particular was famous for its hop yards…” —Tomlan, Tinged with Gold. The author specifically cites 3,000 lbs. of Mass. hops being shipped to NYC in 1763. And by the end of the 1700’s, exporting to Europe (in particular Germany and France), with continued exportation (both Europe and the east coast) of hops as production spread throughout New England in the first decades of the nineteenth century. Excellent stuff, good to see Farnhams get a mention. It’s also interesting to see that comments on hop colour cropped up a few times, it seems to have been a historic concern. The father of Bramling Cross was a brother of Brewers Gold, and so only half Manitoban. Also to try and avoid adding more confusion to the most confusing of terms it’s best to refer to Bramling as a variety of Goldings not a Goldings variety! I guess I’m a little unconvinced on that pine wood point. The old American hops I’ve tried don’t taste anything like pine. Chinooks are from Golding stock and were only developed in the 1980s. Simcoe are proprietary and so the lineage is undisclosed. But Clusters and Comets and those with the Manitoba stock are noted for being “catty,” a quality that I can’t reconcile with piney. Isn’t it more likely that the oast houses were fired by pine wood, which is what the quote suggests the writer thought. We’re speculating in a vacuum here, Jeff, which is always a danger. 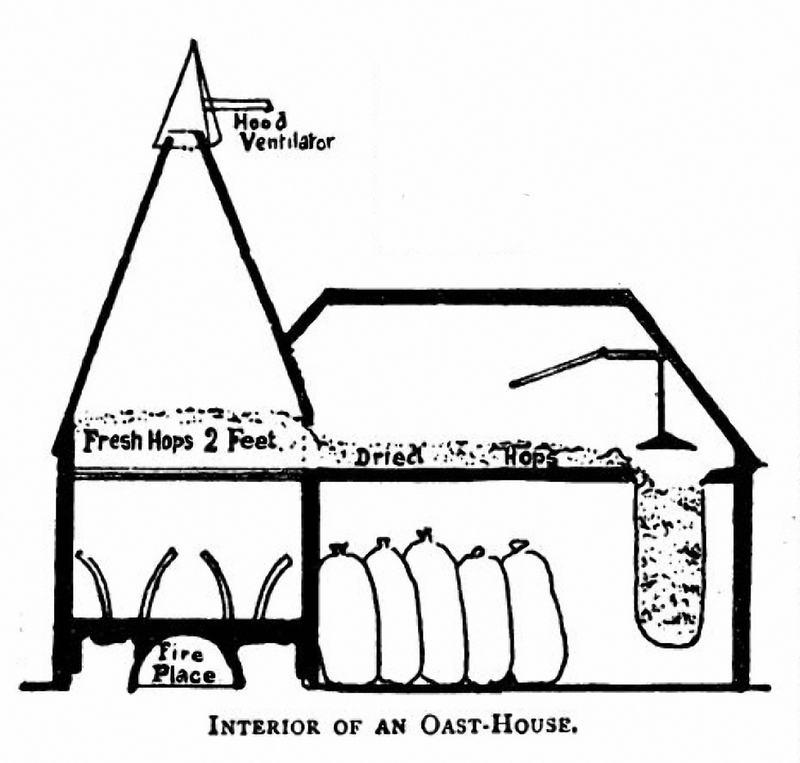 And I have no idea – anyone from the NE United States care to comment on what was the most likely wood to be burnt in an early 19th century American oast house? Both hardwoods and pine would have been available. The forests of the Northeast are considered to be transitional because they contain species of trees found in both the northern boreal forests and southern oak-hickory forests. Maple, Birch, Elm, Beech, Oak and Hickory species, along with White Pine and Hemlock are all abundant in the Northeast. American Beech is one of the most common trees in North America. The food company Beech-Nut was founded in the town of Canajoharie, New York, a small town in western Montgomery County. The western area of Montgomery county was a hops producing region. Maple and Birch varieties are more common in southern New England—Massachusetts, Rhode Island, Connecticut and southern Vermont and New Hampshire. Did 19th-century, New York hops growers use beech wood? Again this is speculation but it was, and is, a common tree species in the hop-growing areas of Central New York. Badsed on my own reading of 19th century British reaction to U.K. hops, the palette of flavours basically hasn’t changed. I agree not every U.S. hop was piney, some clearly were catty or funky (“blackcurrant” expresses that), but in totality, I think a similar range of flavours confronted the British brewer as today except today they are lionized, which is merely a fashion change and possibly a reflection too of how small current English hop acreage is (see Stan Hieronymous’s excellent current hops book on comparatives with other hop growing countries, quite sobering). In concord with the sources here, and what I’ve understood Ron to find, and also based on my own reading over time, I think it is clear U.S. hops were often used from the mid-1800’s in a minority role in British grists, often in porter. I have often added a dash of an American IPA to an English-tasting porter, stout, or pale ale and it is remarkable how you often get an excellent taste. Those British brewers knew what they were about. The U.S. hops “man up” the drink so to speak, the strong taste adds character and complexity but the whole thing – looking at it from an 1800’s British perspective – doesn’t fall over a cliff. By the way wouldn’t the taste of burned wood be quite different from the smell of fresh wood, a la peat particles in flowing water vs. burned peat when assessing Islay whisky character? Sorry, I meant (first sentence), British reaction to U.S. hops. Excellent article:) Your research helped me understand few things about using hops in british brewery industry. I’ve never thought that british people had to import thousands tons of hops to produce beer. Lately I’ve read about hops from Eastern Europe http://bit.ly/1174702 maybe it’s not so important, but also interesting. Who knows whether the flavor of beer came from recipes brought to Bavaria or Walloon region or from brewers from eastern Europe? That was an interesting article about U.S. ales and an apparently prized form of American hops, although the American source might have inclined to a measure of natural boosterism, e.g. California hops were lauded too. It is always hard to know at this remove and clearly some specific-origin hops may have had a good market in U.K. But in general from what I’ve read, the British didn’t wish to use American hops initially and later at most it was as a minority of the hop grist barring extreme necessity. In time however, clearly they were appreciated in this role to the point where efforts were made to develop hybrids with English landraces that could be grown in England. Attempts to categorize and understand are always approximate especially given the many new varieties being developed today. But still I’d say when you have a North American beer, in general you can detect a U.S. taste: piny, citric, dank, call it what you will, there is something that speaks of New World soils and probably the DNA that derives from one of the native varieties Martyn mentioned. Interestingly, the English too had many hops they viewed as “coarse” and the use of which was limited in a way similar for the American ones, e.g., for porter. Colegate was one often mentioned in this regard, and sometimes “Farnhams”. I’d project that these might have had similar qualities to many current U.S. hops. Also, quick correction: Farnhams were generally considered high quality. Jones is a better example of a coarse English variety. “The quantity of hops raised for market were a factor in price level but as Colman suggested quality was vitally important. Attempting to secure a favorable marketing position Massachusetts enacted legislation in 1806 providing that all hops raised in or transported to the state for shipping be inspected therein. High standards of inspection strictly enforced quickly led to improvement in raising and curing the crop and earned for Massachusetts a reputation for high quality hops. In 1819 New Hampshire passed similar inspection laws and the majority of hops raised in Vermont and Maine were sent to Massachusetts for inspection. Thus all New England hops of “Massachusetts first sort” quality generally commanded a premium of one or two cents per pound. 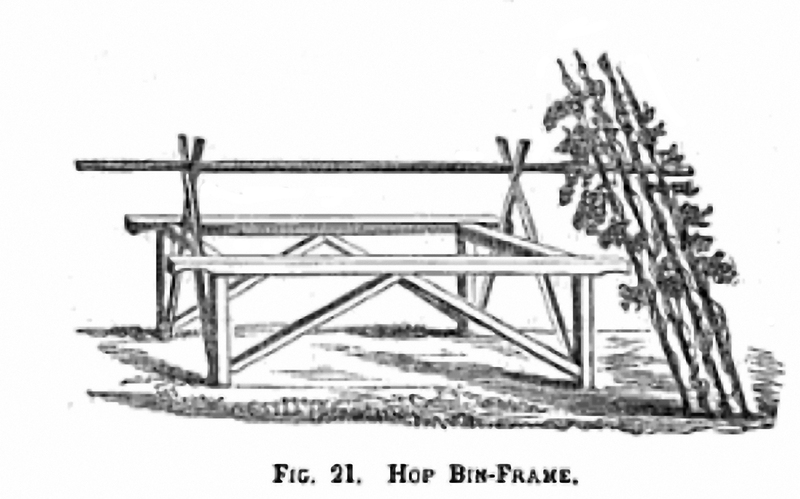 A New York hop grower writing to the editor of The Cultivator in 1834 ruefully attributed the success of eastern hop raisers “in New England to their great skill in curing hops on the kiln. I made an experiment with them upon my kilns in Kent to see if I could destroy the flavour, but it is impossible to do so by any sort of process whatever; it retains the same flavour, and we cannot get rid of it. I feel his pain. I got to like the taste eventually – wonder if he ever got used to it? Fascinating stuff, the last para especially – so Prohibition led (indirectly) to the decline in US hop usage in the UK, and hence to the impact people like Brendan Dobbin and Gazza Prescott had when they started using them (again). I am putting together a poster for the Ealing Beer Festival in which I’m trying to capture the story of hops that left Britain for America (or left America for Britain). I think the information shared above might do the job. I will cite references appropriately. Virgina also has a long tradition of growing hops! they first were planted here in 1621. We have a reference to royal Governor purchasing 40 pounds of hops from a nearby plantation. The local paper the Virginia gazette has many references to hops being bought sold and grown here, our quantity never matched New England’s but, many colonial Virginians grew hops too. As far as wood for the oast houses or malt kilns my money is on whatever the farmer had cut. I think we run a risk of over generalizing; woods varied depending on climate and availability. Even if they preferred one over another they used what they had on hand. Product consistency is NOT a hallmark of 18th century agricultural products.